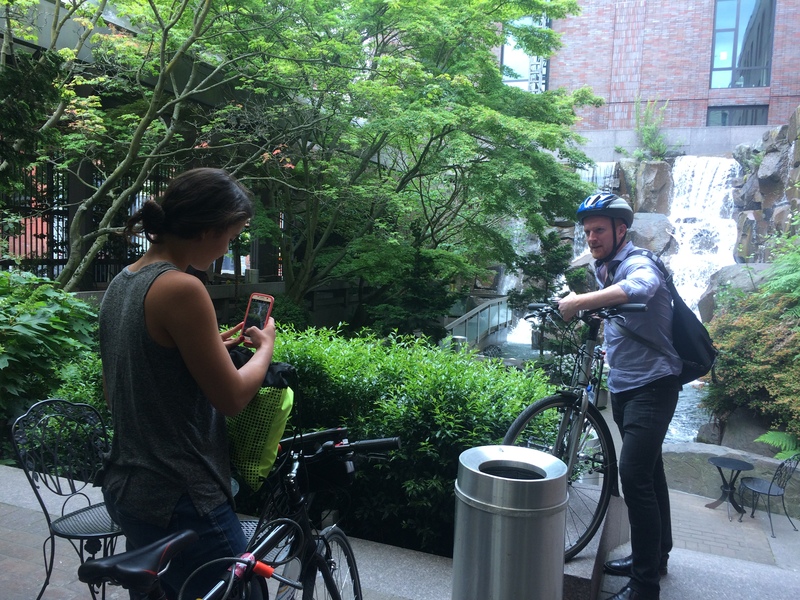 I had the pleasure of biking around Seattle with Elena Studier today, visiting as part of her Summer by Rail trip. With school and finals behind her, college sophomore Elena Studier this summer is taking her bike on an epic 38-day multi-modal “road trip” across the country by rail, visiting more than 18 cities and 15 states. Studier, 20, spent her school year interning with NARP and sketching out her big adventure. She kicks off her trip in New York City and will make stops in 20 locations—including Glacier National Park in Montana–before concluding more than 10,000 miles later in Washington, D.C. on June 20, 2016. She’s about a quarter of the way through her trip, having visited six cities over nine days. I caught up with Elena and Sean Jeans-Gail of NARP shortly after her arrival to the Emerald City, at Zeitgeist Coffee, conveniently close to King Street Station. They were just wrapping up a meeting with representatives from Sound Transit, whose offices are in Union Station, our former train station, located just across the street from King Street Station. The lobby, the Great Hall of Union Station, is open to the public and worth checking out. Train with “unknown power problems” ran out of gas two miles before reaching Portland. Apparently the fuel gauge was broken. Fortunately we were seated on the right side of the train to watch the fuel truck (“We’re going to have a fuel truck come by and see if that might be the problem…”) do its thing so the kids suffered through the two-hour delay just fine. Car rammed train bridge and we had to wait an hour for an inspector to say it was OK to chug over. We stopped at Olympia for that hour so the smokers could get off and smoke. Elena is also using other forms of public transportation as she travels, to highlight the various modes available. I made use of this yesterday when I dropped my bike off at a bike shop for a tune up and grabbed a bus back home. I took Elena and Sean to said bike shop, Back Alley Bike Repair because due to its proximity to the train, ferries, water taxi, and BoltBus, they see a lot of multi-modal bike travelers. And they’re awesome. There was also a quick stop at Waterfall Garden Park, which has always amused me since it’s quite loud, yet people sit at the tables, trying to chat with friends. But it’s unique and a quick ride or walk from King Street Station. Next up we met up with “celebrity” traffic engineer, Dongho Chang and Darby Watson from SDOT in Occidental Park just across the street from Back Alley Bike Repair. The park is bustling with food trucks, tons of seating, games (currently a foosball table, and I’ve previously seen ping pong and giant chess), totem poles, and musicians. 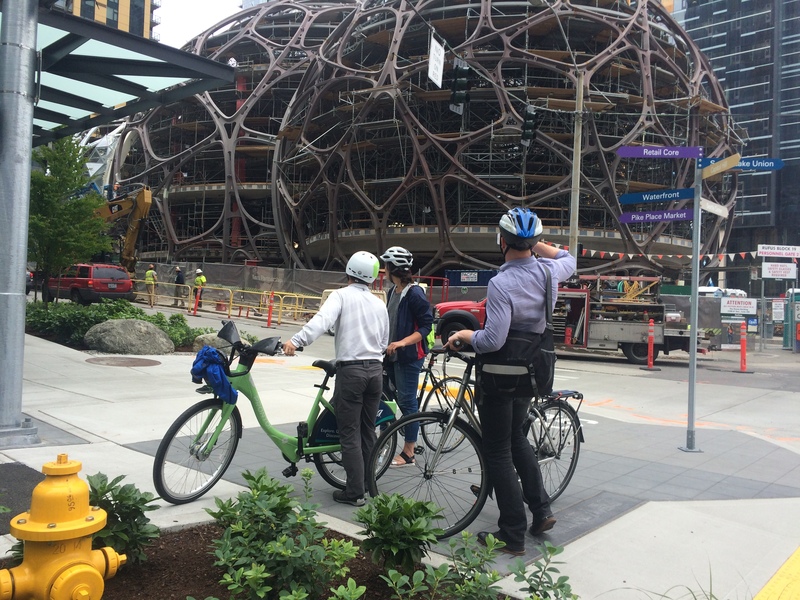 Dongho led us on a tour of Seattle’s latest and greatest bike-friendly infrastructure, including the 2nd Avenue protected bike lanes, Bell Street Park, the Mercer and 5th Avenue North bike lanes, and the 7th Avenue protected bike lane (and bicycle leaning rail!). We learned a bit about upcoming improvements–some not announced just yet. Exciting stuff! I pointed out to Elena and Sean that I found it a shame we had to utilize the sidewalk so much for our tour with Dongho, but at the same time, one of the first things I told them about Seattle is that it’s legal to ride on the sidewalk here…although I also pointed out that I find it sad that I consider that such valuable information. But it really is necessary for most people riding bikes in the downtown area. For now, anyway. Dongho and Darby headed back to important SDOT stuff and I tagged along as Elena and Sean headed into a meeting with Alta Planning + Design. 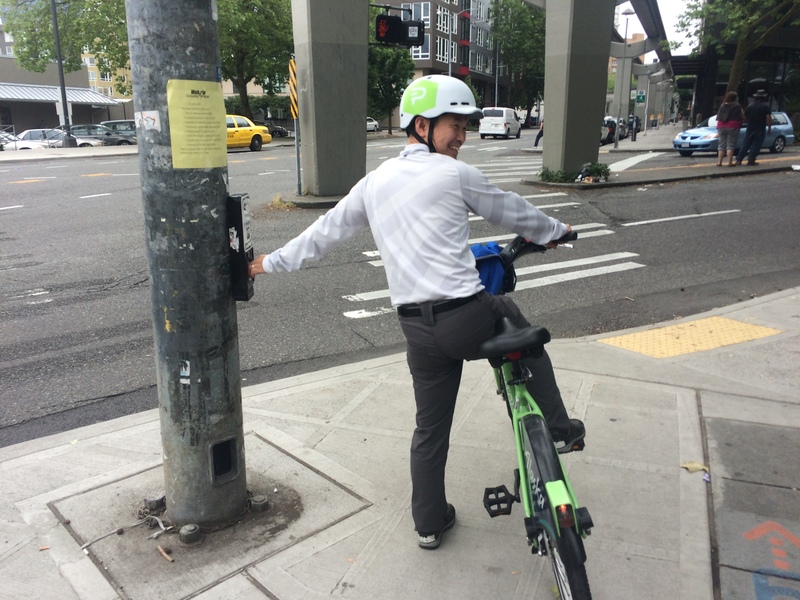 We talked NACTO, various projects, and secure bike parking at transit stations. They had lots of great questions for Elena so I learned even more about the project. I was particularly interested to hear that rather than push an agenda of her own, Elena hopes to amplify the messages of the people she meets. Lunch was at Pike Place Market, our bikes locked securely at the bike corral (the one on Pike Place, not the fence on Pike Street by the balloon clown), while we explored on foot. We dined in Victor Steinbrueck Park, watching Washington State Ferries on their ways to Bainbridge Island and Bremerton and the Clipper Ferry on its way to Victoria, BC, Canada, while I shared tales of bike-and-boat trips I had taken. My cargo bike and tandem bike aren’t allowed on buses (other than BoltBus) and trains, but they fit on boats! So the ferries make some wonderful trips possible, like our most recent family bike camping trip at Illahee State Park and Spring Break 2015 on Vancouver Island. 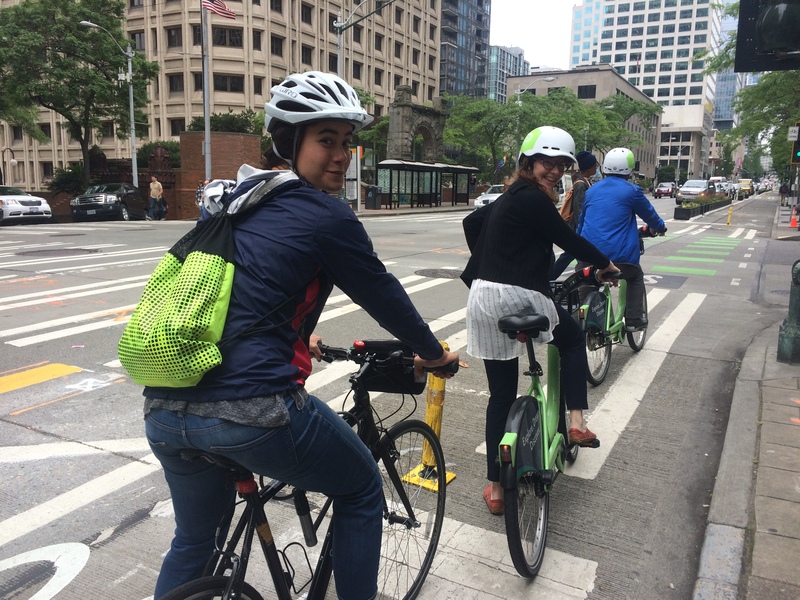 Rather than navigate the Pike Place Market crowds with our bikes to get to the elevator, I led us down Western Avenue. I discovered Western Avenue as a not-too-steep route up from the waterfront by finding a pedicab driver without an e-assist to follow. One of my many route-finding tricks. Elena agreed with me that steep downhills are even worse than steep uphills. 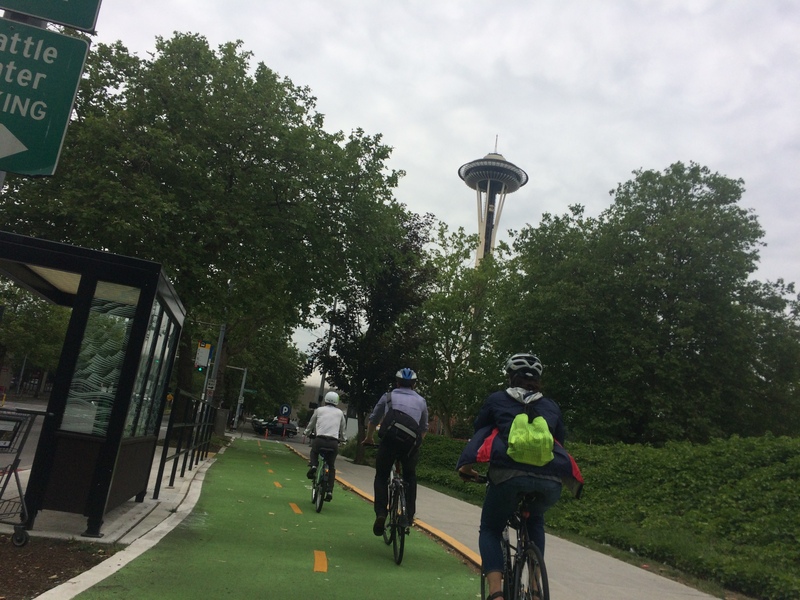 I apologized for the state of our waterfront, but we were soon at the beautiful Elliott Bay Trail and pedaling through the Olympic Sculpture Park and Myrtle Edwards Park. I pointed out the West Thomas Street Overpass, another not-too-steep as well as all-user-friendly route up from the waterfront. I had to rush home to fetch the kids from school and cut off towards the Ship Canal Trail while Elena and Sean pushed on to the Ballard Locks and beautifully bikey Ballard. I look foward to reading about their experiences there, as well as the Burke-Gilman Trail (and Burke-Gilman Trail Missing Link), Link light rail, and Broadway Cycletrack. Happy rails to you, Elena! Wait! Just answered my own question. I hope you can go! And LOL the wi-fi comment!!! !